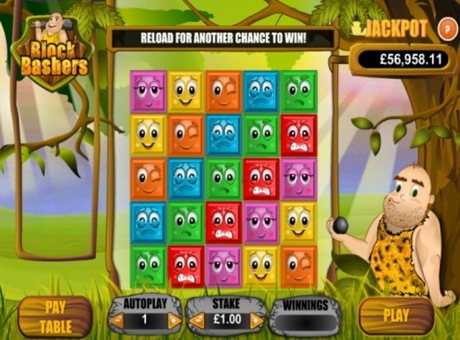 Block Bashers is an exciting arcade, bejeweled-style game where matching combinations of blocks pay multiple amounts of cash based on your stake. All you have to do to win is match 5 or more of the same symbols in a group where the symbols are vertically or horizontally adjacent to each other and they'll explode enabling more symbols to drop down in their places. You can bet from 10p up to £10 per game. Once all 5-symbol winning combinations on the game screen have exploded the remaining blocks will move downwards into the available space and further blocks will fall down to fill any gaps. Any winning matched combinations thereafter will again explode until the winning combinations have exploded for that game screen with further blocks falling down until such time as no further winning combinations remain on screen. You have the option to auto-play up to 50 games. If you match 6 or more of the Orange character symbol you will trigger the bonus feature. A message will be displayed in the game grid and the game will continue until there are no more winning combinations at which point the bonus feature will be played. Select an egg to reveal your stake multiplier and prize. The amount won is calculated by multiplying the stake placed on the winning line by the multiplier achieved - from x5 to x100! The Progressive Jackpot is won if you match 8 or more Red symbols. To qualify for the full progressive jackpot amount, you must stake max bet (£10.00), otherwise you'll get a share of the jackpot, proportionally to you bet amount - from 1% (10p bet) to 50% (£5.00 bet). The theoretical average return to player (RTP) of this game is 93.92%, including jackpot.